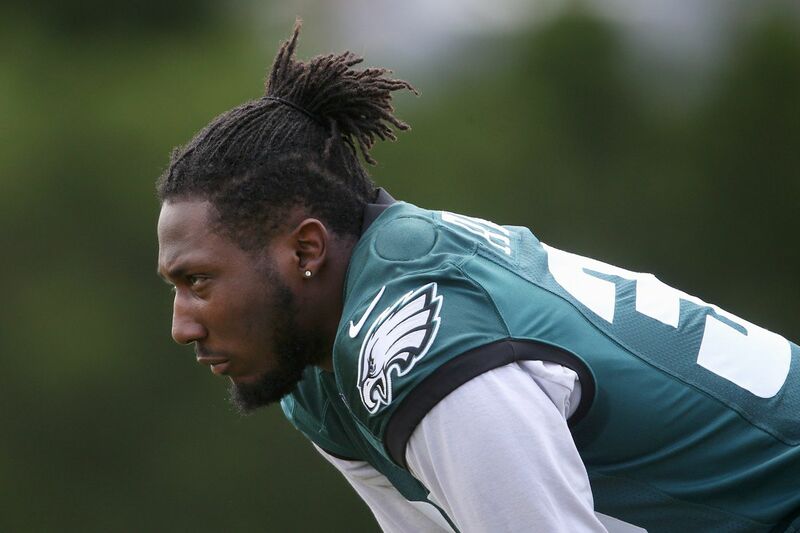 Josh Adams has had to do a lot of waiting the last 3½ months. Then he spent the spring workouts and minicamps waiting for a hairline fracture in his right foot to heal. The injury initially was spotted during a medical exam in February at the NFL scouting combine. "I wouldn't say it's been frustrating,'' said Adams, who finally was cleared to play two weeks ago, at the start of training camp. "I'd call it a test of my patience, testing the mental side of things. Adams' first two weeks of camp have been mainly about shaking off the rust and getting comfortable with the Eagles' offense. He knows he's facing an uphill battle to make the 53-man roster. The Eagles likely will only keep four running backs, and three of the spots pretty much belong to Jay Ajayi, Darren Sproles, and Corey Clement. The other four backs in camp are Adams, Donnel Pumphrey, Wendell Smallwood, and Matt Jones. Pumphrey, who is 5 inches shorter and 40 pounds lighter than Adams, has had the best camp of the four. But the true test will come in the Eagles' four preseason games, beginning Thursday night against the Pittsburgh Steelers at the Linc. Adams is a powerful runner with good speed – he ran a 4.48 40 at his predraft pro day, despite the hairline fracture. He rushed for 1,430 yards last year, 994 of which came after contact. The Eagles gave him the highest bonus — $55,000 — of any of their undrafted free agents. But his upright running style could negate his power at the pro level. Most importantly, he needs to convince the Eagles that he can be a reliable receiver, which is a must for a running back in their offensive system. Adams had just 13 catches last year at Notre Dame and only 41 in three seasons. In Tuesday's practice, he dropped three catchable balls. The most likely scenerio is that Adams will spend his rookie season on the team's practice squad, which wouldn't be the worst thing in the world. It would be similar to what the Eagles did last year with Pumphrey, a fourth-round pick who struggled last summer after breaking the FBS career rushing record at San Diego State. He was put on injured reserve with a hamstring injury. "That's what it's about when you draft young players, invest in them,'' Eagles coach Doug Pederson said Tuesday. "Sometimes, it's going to take a couple of years – two, three, even four years — to really see their full talent and how they grow with the offense." The traffic at running back figures to be lighter next year. Sproles is 35 and plans to retire after this season. Ajayi is entering the final year of his contract, and no matter how well he plays this season, it's unlikely the Eagles will re-sign him. They will need to cut some salary-cap corners to make room for Carson Wentz's blockbuster second contract, and the running-back position figures to be one of the places they'll do that. The combined 2019 salary-cap cost for Clement, Pumphrey, and Adams would be just $2.1 million. But Adams isn't ready to concede a roster spot. He's hoping to play well in the preseason games and convince the coaching staff he can help them this season. "I'm just trying to learn from being out there,'' he said. "Learning from my mistakes. Learning from others' mistakes. Each day, I have to learn something new and get better. "I'm blessed to be a part of this organization. I knew God had a plan for me. I'm here now. I'm healthy. So everything is in the past, and I'm ready to move forward."